Some day soon, you may get your wish to be brainier. According to researchers at MIT, a single gene and its growth-promoting protein (CPG15) may be used to develop therapies for renewing damaged or diseased brain tissue. "CPG15 is one of the few molecules shown to be essential for survival of specific stem cell populations in the developing brain," Nedivi said. "...CPG15 allows the progenitor pool (of cells) to expand, and even modest changes in the size of the progenitor pool during its exponential growth phase can drastically affect the final size and shape of the cortex." 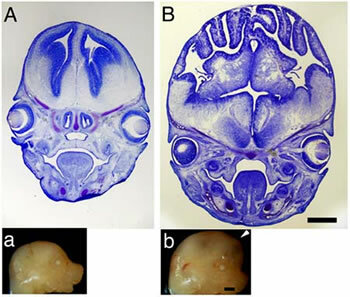 Over-expressing CPG-15 in rats gives them bigger brains; these enlarged brains have grooves and furrows like evolved mammalian brains with larger surface areas. In another recent study performed at Harvard, the beta-catenin gene in selected mice was engineered to exhibit increased activity; the mouse brains grew to almost double the usual size. The cerebral cortex, seat of intelligence and language, became more human like.